As part of the international M.Sc. Program of Environmental Governance at the University of Freiburg, students are responsible for conceptualizing, developing and organizing an annual Freiburg Forum on Environmental Governance. 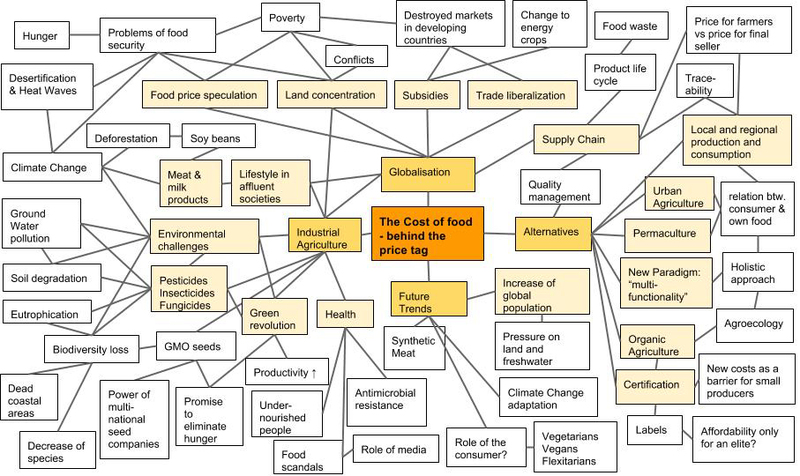 In 2014 this student organized event will focus on ‘The Cost of Food’. To understand the complex dynamics of our food-system and the potential for a sustainable change, we chose a trans-disciplinary approach, involving a high degree of interaction with non-academic actors as well as scientific experts. To be able to manage this balancing act, we have a series of small, practical and interactive events -a Smartphone App mAppetizing, the Mensa Event, Urban Agriculture and a Bike Tour. These events showcase the spectrum of different costs, on different levels. Every single event itself shows best practices and solutions for the cost addressed. We will show the outcomes of the events in an exhibit, leading up to a workshop session and panel discussion on February 22nd 2014, synthesizing the various perspectives, and showing the way towards a truly affordable food system. Get some inspiration, explore our Library and easily export or cite the references.